What do you do when you need extra cash? Do you charge up the balances on your credit cards? Do you borrow money? It is time to make positive moves that will help you increase your income without putting yourself deeper in debt. I have been helping moms earn money at home for more than 25 years while protecting their best interests. I can spot a scam from a mile away and never recommend anything without careful consideration. Lately, I have encountered so many more moms who need immediate income and I knew I had to do something to help. That’s why I wrote Fast Cash Ideas for Moms. At the very beginning of this section, I tell you about an income-generating discovery I recently made that is 100% real. You can work online today and get paid tomorrow. I use this website and have earned over $500 there in just a few weeks. It is run by a trusted source that you know and there are no fees involved. The rest of this section contains multiple ideas for earning fast cash, including 7 things you can sell fast in an emergency and 9 services you can provide for quick money. Once the emergency if over, you will want to continue to earn extra cash to make your life easier and more fun. This section will help you create a plan that you can use going forward. You will learn how to make the time to make extra money, answer questions that will help you make good decisions, and create a unique selling plan. We all know that we can sell things we already own on auction sites like Ebay to earn extra cash. However, setting things up can be confusing. This section will give you exact instructions for selling on Ebay and other sites, including one that will buy your unwanted electronics directly from you. This list of 300 fast cash ideas is meant to spark some ideas that you can research moving forward. Money is money, no matter how we get it. This is a list of 83 ways you can save money, and many of them will open your eyes! Because I know that you don’t have a lot of extra cash on-hand, I have priced this Special Report so that you can get it immediately. The price is only $5. All you need to put more money in your life today is to click on this link now and order for immediate download. 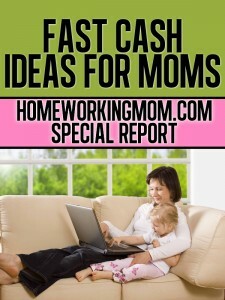 I Want My Fast Cash Ideas For Moms! The author, Georganne Fiumara, is the founder of Mothers' Home Business Network (HomeWorkingMom.com). She was chosen by Woman's World Magazine as one of America's Ultimate Experts on earning money at home. Her articles about working at home have appeared in Family Circle, Woman's Day, American Baby, and many places online. Georganne brought up her two children while working at home, and in her work with Mothers' Home Business Network, she has been helping moms find ways to earn at home for more than 25 years. Have a question? Want to discuss working at home? "I have learned, as a rule of thumb, never to ask whether you can do something. Say, instead, that you are doing it. Then fasten your seat belt. The most remarkable things follow."